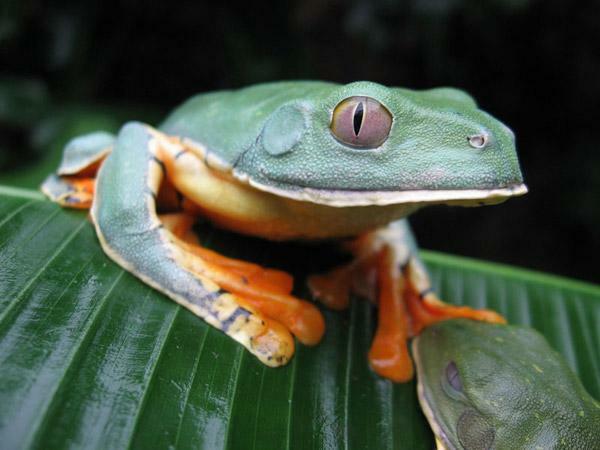 Costa Rica is the greenest country on earth. Over 25% of the country is set aside as protected areas where rare and endangered plants and animals are allowed to flourish. Costa Rica is on the isthmus of Central America wedged between the Pacific Ocean on its west coast and the Caribbean Sea on its east coast. In between are incredible beaches, virgin forests, placid blue lagoons, active volcanoes and thousands of species of colourful plants and animals found no place else on the planet. Whether you are looking for a party or are seeking peace and tranquillity you can find it in Costa Rica. Some of the world's best nature preserves are located in Costa Rica. Places like Tortuguero National Park, Monteverde Cloud National Park and Irazu Volcano National Park are home to some of the most colourful plants and animals on the planet. Costa Rica has over 9000 plant species. It has rainforest, mangrove swamps and some of the most complex ecosystems in the world. These ecosystems provide nests and feeding grounds for 850 bird species, 200 mammal species, 35,000 insect species, 150 species of amphibians and 200 species of reptiles. It has a level of plant and animal density and diversity few nations can match. Beaches are what draw many people to Costa Rica and with good reason. Costa Rica's braches are routinely voted among the world's best. Nearly 2/3 of Costa Rica's borders are on the coast. This means the country has hundreds of kilometres of beaches on its Pacific and Caribbean coasts. Places like Manuel Antonio National Park and the Nicoya Peninsula boast spectacular beaches like Tamerindo, Montezuma, Mal Pais, Playa Grande, Playa Hermosa, Playa Conchal and Playa Flamingo. These beaches draw hundreds of thousands of tourists each year with their horseshoe shaped bays, soft milk-white sands and warm turquoise waters perfect for swimming, surfing, snorkelling, kayaking and myriad other water sports. Costa Rica also has wonderful rivers, breath-taking waterfalls, large lagoons and numerous hot springs. There are tours which can take visitors to unbelievably beautiful places. Tours take tourists through pristine virgin forests and lead them to secluded springs where they can heal anything that ails them. Visitors can hike up Arenal Volcano one of the world's 10 most active, Poas Volcano with a main crater over 2 kilometres wide and 1,000 kilometres deep or Irazu Volcano, Costa Rica tallest active volcano. The view from the tops of these smouldering volcanoes is stunning. Dawn in Costa Rica finds many people praying, playing or taking surf lessons on one of the many picturesque beaches. By midday visitors are flying through the tree tops on zip lines, sitting in the shade or swimming in a cool, clear lagoon. Sundown in Costa Rica means salsa, meringue, rock and reggae music in clubs, exotic meals in quaint seaside restaurants and cafes and smiling tourists watching the sun go down in an explosion of colour. Click here for great deals and offers on Costa Rica Tours and luxury holidays.